Today, with sparkling white and wild-looking pinto racehorses competing at racetracks in several countries, The Tetrarch may not seem quite so unusual. But when this horse arrived at the track as a two-year-old in 1913, no one had ever seen anything like him — and when he ran, his speed left people awestruck. Even today, he is considered one of the fastest two-year-olds ever to race in England. Many reports suggest that the fleet grey stallion was a white sabino and the source of sabino white in today's Thoroughbred pedigrees, but nothing could be further from the truth. This exceptional horse was not born white or even partly white. He was solid chestnut with black “Bend Or” spots all over his coat. These are named for The Tetrarch's great-grandfather, who was liberally sprinkled with them. Bend Or inherited them from his ancestor Pantaloon (1824). Bend Or spots are still seen on modern Thoroughbreds, having been inherited from one generation to the next for well over a century. As The Tetrarch aged, he turned grey, and the black spots turned white, leading to his nickname “The Rocking Horse” and later, as his exceptional speed became evident, as “The Spotted Wonder”. Every grey horse must have at least one grey parent, and The Tetrarch was by the grey Roi Herode, by the grey Le Samaritain, by the grey Le Sancy, and so on — an unbroken line of greys going all the way back to Alcock's Arabian (born 1700), the first grey ever recorded in the British Thoroughbred stud book, and through him to Darcy's White Turk (also called the Sedbury Turk), born in Syria in the late 1600s. Every grey Thoroughbred today is descended from Alcock's Arabian through Le Sancy. Without him, the colour grey would have been lost from the breed forever. 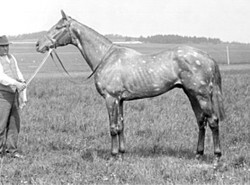 Since The Tetrarch was not born with his distinctive white spotting, he could not have been a source for sabino spotting in Thoroughbreds, but he did pass on his strange spots to his grey descendants. Even today, many a grey Thoroughbred has at least a few of his distinctive spots, and a check of the pedigree will reveal a line right back to the Spotted Wonder. The Tetrarch was an unusual horse in other ways, not just because of his distinctive spots. His sire, the grey French horse Roi Herode, won three times (one stakes race) in 24 starts before breaking down while in training at age five. He was described as a decent runner but a plodder, was short-coupled like an Arabian, but had a somewhat plain head. His owner, Edward Kennedy of Staffan Stud in Ireland, bought the horse to try and revive the Herod sire line, which had nearly disappeared. Roi Herode's sire, Le Samaritain, won several stakes including the French St. Leger before being sent to Uruguay and then Argentina. Roi Herode's dam, Roxelane, was a multiple stakes winner and very well bred. The Tetrarch's dam was Vahren, a chestnut daughter of Bona Vista by Bend Or. She won three times in 12 starts and produced six other foals, one of which was sold to Russia and won the Russian Oaks. A full sister to The Tetrarch, Royal Quest, was sold to W. S. Kilmer of the United States. That line ended with some of her offspring going into the U.S. Remount Program. Another daughter was sold to France. The Tetrarch was a late foal, born on April 22. As a yearling, he was a big, awkward, gangly colt who looked very unpromising, especially with his odd colouring: black and white spots on a chestnut coat that was changing to steel grey. He was purchased by former amateur steeplechase jockey Henry Seymour “Atty” Persse, who had trained the horse's half-sister, Nicola. Unfortunately, he was short of funds and needed cash, so Persse reluctantly sold the colt to his cousin, Major Dermot McCalmont, M.C., M.F.H., but Persse stayed on as trainer. In April of his two-year-old year, The Tetrarch was sent out to train with a group of advanced two-year-olds and shocked everyone by blasting ahead of them easily, winning at a canter. After that, he was tested against a quality older runner and a pair of good two-year-olds, and he beat them in a canter, too. One of those beaten youngsters became a stakes winner his first time out. The Tetrarch was tried twice more against the older horse, a staunch handicap winner, once at level weights and finally with The Tetrarch carrying 9 stone to the handicapper's 8 stone, but each time it was no contest, with the youngster winning as he pleased. Clearly this spotted colt was special. As a two-year-old, The Tetrarch started seven times and was undefeated, six of his wins being stakes. All his races were at five and six furlongs. He was champion two-year-old of 1913. He was scheduled to race at three at longer distances, but injured a front leg late in his two-year-old year and had to skip the Two Thousand Guineas. He re-injured the leg during a workout in May 1914 while preparing for the Epsom Derby, and McCalmont and Persse chose to retire him. Both injuries were caused by over-reaching, with a hind hoof grabbing a front one. Persse (1869-1960) described The Tetrarch as having a beautiful head and intelligent expression, with remarkable muscular development and straight, powerful hind legs. He galloped absolutely true at speed with great length of stride, but “plaited” in front at a walk or canter. Physically, he epitomized the words “race horse” with his long, lean appearance, reach of neck, straight legs and overall look of elegance and quality. At two, he was as big and developed as a four-year-old. In temperament, The Tetrarch was docile, and only two things could cause his rage to flare up: being shod by a stranger and taking medication. To avoid the first, he had his own farrier who travelled with him. The Tetrarch took up residence at McCalmont family's Ballylinch Stud in Co. Kilkenny, Ireland, a facility built especially for him and, it was hoped, a future line of great horses. The floor of his stallion box even had his named spelled out in mosaics. With his race record, excellent conformation and beautiful action, The Tetrarch seemed destined to be the sire of the century, but he was not very interested in mares. It took as much as twenty minutes before he would breed some mares, and a slight noise or distraction could change his mind. Ironically, his several-times-great-grandson, the Kentucky Derby champion War Emblem, has the same problem, although he is very aggressive towards mares instead of simply ignoring them. War Emblem has sired only about 150 foals in ten years at stud. He rejected almost all of the 300 mares presented to him in 2010, and in some years he sired no foals at all. In ten years at stud, The Tetrarch sired just 130 foals, with only one in his last crop. But what foals they were! Eighty became winners, with a total of 257 races won. Three of his sons won the St. Leger Stakes, and several others were classic and/or major stakes winners. Another became champion sire in Brazil. His champion son Tetratema won 13 of 16 starts and was an exceptional sire, especially of high-class sprinters. Other important sons included champion The Satrap and Stefan the Great, top broodmare sire in England in 1939. He was leading sire in England in 1919, third in 1920 and third again in 1923, despite having so few runners. The Tetrarch's greatest offspring was a grey filly named Mumtaz Mahal, born in 1921. Known as “The Flying Filly,” she inherited her sire's odd spots and his blazing speed, winning ten stakes between five furlongs and a mile. As a producer, she first appeared disappointing, as her offspring only won a handful of minor stakes. But when those horses entered the breeding ranks themselves, how things changed! The grandchildren and great-grandchildren of Mumtaz Mahal won many classic races and other important stakes in several countries, and founded families that would produce such great horses as Migoli, who won won the Prix de l'Arc de Triomphe and sired Belmont winner Gallant Man; the perennial leading sire (and notoriously temperamental) Nasrullah; and horses like Nashua, Never Say Die, Mahmoud, Petite Etoile, Royal Charger and Tudor Minstrel. It is somewhat ironic that neither The Tetrarch nor his sire became the savior of the Herod (and thus the Byerly Turk) sire line, once very dominant, which had nearly disappeared by the end of the nineteenth century. Thanks to The Tetrarch, it did have a surge in popularity for a time, but today it has almost faded away completely. The direct sire line from The Tetrarch still exists in South America, and other parts of the Herod line remain alive in Europe, but it is rare. But that is not to say The Tetrarch's influence vanished — far from it! Virtually every grey Thoroughbred alive today traces back to him. Many of his grey descendants bear his famous white spots, although few have as many as he had. Through his daughters, the blood of the Spotted Wonder runs strong. Without The Tetrarch, there would be no Bold Ruler or Northern Dancer, no Sunday Silence or Mr. Prospector or A.P. Indy, no American Triple Crown winners Count Fleet, Secretariat, Seattle Slew or Affirmed. There would be no Genuine Risk or Ruffian, no Zenyatta or Rachel Alexandra. In fact, it would be difficult to find a great racehorse of the last 50 years that does not trace back to The Tetrarch somewhere in its pedigree. For a horse that raced just seven times and only sired 130 foals in his lifetime, The Spotted Wonder was a wonder indeed. The great horse died at the age of 24 on August 8, 1935, and was buried at Ballylinch Stud. His champion son Tetratema is buried nearby. A flat granite stone and plaque mark The Tetrarch's grave, and his stallion box with his name spelled in mosaics is still in use. The McCalmont family sold Ballylinch to Dr. Tim Mahoney in 1987. Upon his death in 2008, it passed to his daughter, Jenny Howes. Ballylinch is still a thriving stud farm, with recent stakes winners including 2006 Breeders Cup Turf winner Red Rocks. The stallion roster now includes 2010 European co-champion two-year-old Dream Ahead, dual Classic winner Lupe de Vega (who occupies The Tetrarch's stallion box) and Group I winners Intense Focus, Lawman, Soviet Star and Beat Hollow. Fittingly, all are descended from The Tetrarch, the amazing Spotted Wonder. Want to know more? Here are some books you may enjoy. Follows The Blood-Horse's Top 100 list, beginning with Man o' War in the No. 1 spot and ending with Blue Larkspur at No. 100. Great post and very well written ;) Learned stuff actually!